Shamelessly shoving that awesomely low-resolution hand in the reader’s face! While I’m sure I’ll eventually update to a better model, I’m kind of fond of these 2004 Half-Life 2 models, flaws and all. Trust me, you won’t even notice the difference once you’re reading the comics! You’ll notice that my character is holding a very odd phone of some sort. That’s a hi-tech transparent smartphone that will accompany him throughout his misadventures and has a multitude of useful apps to solve problems – or humorously help move the plot forward, deus ex machina style. The phone, which I won’t officially name yet (“Mythos’ Phone” will do for now), will be a character trademark or icon of sorts, and the handiest tool in my personal skin’s arsenal. Oh, and if you’re wondering about its origin, it was actually FZE who modeled it at my request years ago – I think it dates back to 2011! It was meant for another comic but had the exact same role and purpose. Better showing up late than never at all! As for further details on the series, Mythic Comics will have a slightly different format from The Adventures of Hercule Cubbage, with longer pages and editing differences in details such as speech font and speech bubble style. Also unlike TAoHC, each issue won’t be a set number of pages, meaning some issues may be longer or shorter, but more importantly, I can pace the comics a bit better. Let me repeat, you don’t need to read all that to understand Mythic Comics. It just serves as backstory that might improve your enjoyment of the brand new series. 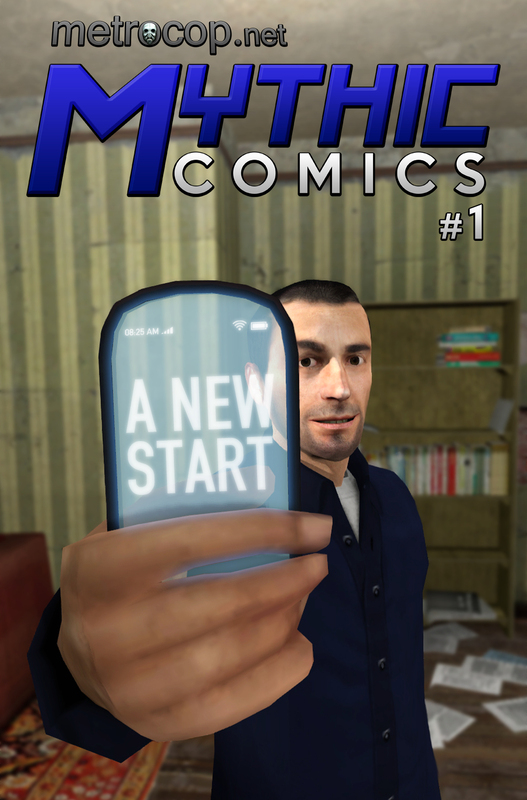 Mythos the character returns from hiatus this Friday with Mythic Comics #1 – don’t miss it! And stay tuned to the Metrocop forums for more goodness from our budding community! Next Beyond Borders Re-released on the Forums!